The ALPS Mountaineering Featherlite sleeping pad is one of a series of ultra-lite pads coming from this small company located in rural east central Missouri. ALPS offers performance-oriented packs, tents, sleeping bags, furniture, air pads, and air beds — a good start for those backpacker/campers who love the adventurous life. Since the ALPS Mountaineering Featherlite sleeping pad does not contain any foam, once inflated, all you have is the weight of the fabric and air. If you choose the regular size, your pad will weigh just over one pound… next to nothing when you get right down to it. And let’s face it, backpackers these days are looking to save every oz. Disclosure: 3Beds.com contacted me to try one of several styles of sleeping pad. The one I chose was the ALPS Mountaineering Featherlite. It was provided at no cost to me. My only responsibility was an agreement to complete this review after trying the item. I was not pressured in any way to make a positive endorsement. This air mat comes with its own built-in pump located near the head of the pad, so no extra pumps or cords you have to carry around. Inflation takes just a couple of minutes and is done via the included pump near the head of the pad. The ALPS instruction video suggests it takes little more than a minute to pump up this air pad… perhaps a little longer if it has been stored in its included pouch for awhile. My experience was that the first inflation took more like 10 minutes. Sill not bad if you aren’t in a hurry, but a little long if you’re inflating it every day on a thru hike. Perhaps I will get better at it with practice. As with all ALPS air pads, the Featherlite series features brass valves for long-term durability and comes with a stuff sack and repair kit, so there’s not a bunch of after-sale accessories to purchase. It uses horizontal air tubes, a feature that I could immediately see would prevent sag in the center when you’re laying on it. Let me say here that I am not a camper. I absolutely love to day hike — it is my passion and favorite hobby — but I’m also used to my creature comforts. I have been wanting to take my hiking farther afield, to places that are just a little too far away to make it back the same day. So I’ve been looking for some type of pad or mat that I could use in the back of my Subaru Outback as my sleeping quarters. No tent… no RV… just me and my Subaru one night at a time. I found a 4-inch thick foam pad that works just fine, but obviously you can’t take it backpacking. So the ALPS Featherlite was an interesting option. 3Beds offer came at a convenient time. 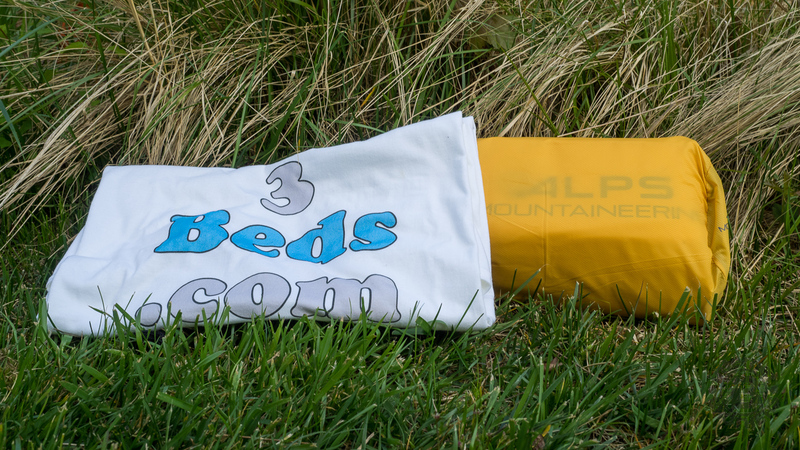 This is the ALPS Mountaineering Featherlite air mat in its included stuff sack as provided by 3Beds.com. The ALPS Mountaineering Featherlite comes in two sizes, regular and long. The regular is 20″ wide and 72″ long, perfect for the back of my Subaru, and for my height. For those who are taller than me, the long is 24″ wide by 77″ long. The regular weighs in at 1 pound 4 ounces, while the long is 1 pound 9 ounces. Each fully inflates to a height of 3.5 inches. This was my first time doing the pretend like you’re a camper trick by sleeping in the back of my Subaru. To be brutally honest, I wasn’t the least bit comfortable. But I don’t necessarily blame that on the ALPS pad. I was kinda learning as I go. For example, I chose to use both the foam pad and the ALPS mat. Next time I will only use one or the other. There is a slight hump in the surface of the Subaru when the back seats are folded down. Despite having two pads I was like The Princess and the Pea fairy tale. No matter how I turned I could feel that seam under me. I think I can correct that in the future with a couple of strategically placed towels. Again though, not the fault of the ALPS pad. Because of the combined height of the two (7.5 inches) I didn’t have much room above me. So I couldn’t be seated, I had to lay down. It made getting undressed and redressed somewhat difficult. Also the rip stop fabric of my sleeping bag kept wanting to slip and slide on the sheet I had over the two pads, so I was constantly rearranging. When I finally fell asleep, I slept pretty well, but on future outings falling asleep will take a little getting used to. I know. I’m a wuss. Learn with practice. What I can tell you about the ALPS pad is that it did a good job of holding air once inflated. Over the course of three full days, the pad maintained, I would guesstimate, about 80-90% of the air I originally pumped into it. I’ve had experience with indoor air mattresses in the past that are basically flat when you wake up in the middle of the night and wonder why you’re laying on the floor. 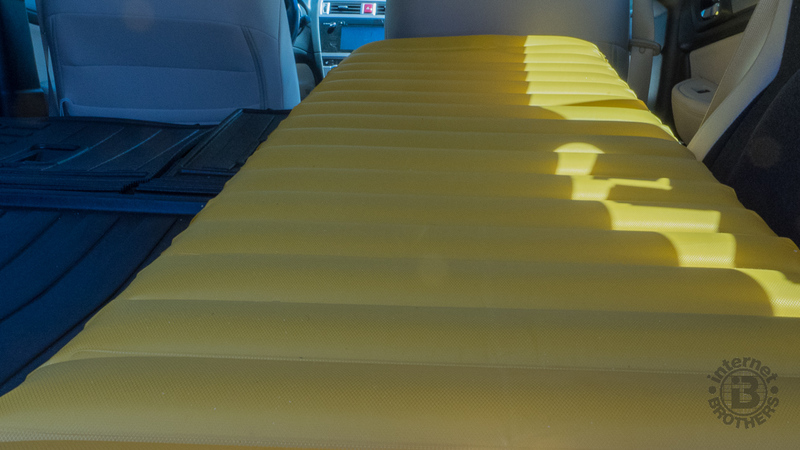 Here is the ALPS Mountaineering Featherlite sleeping pad in the back of my Subaru Outback. It fit perfect. The ALPS Mountaineering Featherlite comes in a golden yellow color and the two sizes mentioned above. The regular has a MSRP of US$89.99 while the long is US$99.99. You can purchase them directly from the manufacturer at ALPS Mountaineering’s website or from Amazon. As I gain more experience using the ALPS pad I will be sure to return here to offer more thoughts to help you make your own decision about whether to purchase this product. For example, I will test to see if the inflation is quicker with practice. I may even see how it does sleeping on the ground. Do you think I’ll eventually learn to like camping? Stay tuned.